This peak is #44 on the Height List for Alaska . This peak is #7 on the Height List for British Columbia .Mount Root is a challenging border peak at the north end of the Fairweather Plateau. It's the 5th highest peak in British Columbia but wasn't climbed until 1977. 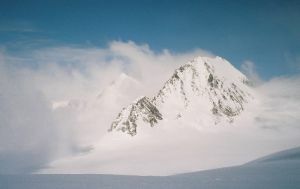 The first ascent party climbed a variation of the south face. It involved 22 pitches of ice climbing with a camp-to-camp return time of 31 hours!! It's rarely climbed for obvious reasons.